As a writer, I have found the hardest thing for me is to write beginnings. The start if a story is always the hardest for me and I tend to change them about five times before settling on one that works for the story. 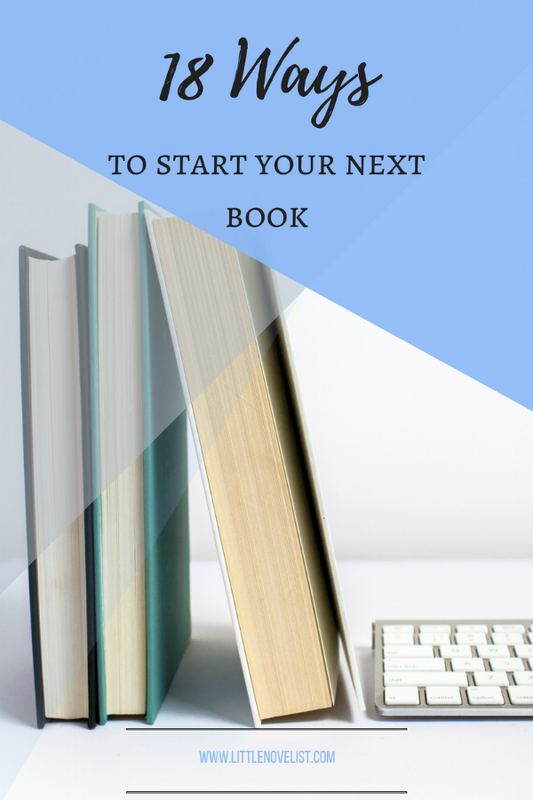 So, I thought I would share some ways to start a novel which will be exciting, beneficial and get your readers hooked. Sometimes, it might even be best to just start writing and fix the beginning later on when you're doing your revising and editing. For example, I have recently created a new chapter one and edited the beginning of chapter two which was the first chapter before I started a re-write. The Shannara Chronicles TV Show starts Will's story off with the death of his mother. This prompts his uncle to share information about his father and ends up with him going on an adventure. You could have your character die, then be brought back to life by some government agency, or have their death faked to try and get away from someone who is hunting them down. The possibilities are endless. I have read a few stories where the main character meets someone new in the first chapter. A stranger on the train, a dashingly handsome customer at their store and maybe even new members of their crew. What about having your character start a new job? Maybe they wanted to be promoted but failed the test and ended up doing a new job, and meeting the person who sets them off on an adventure? This one is possibly my favourite as there are so many ways you can take this depending on your world. Is your world made up? What kind of crimes can be committed? Will they get arrested? Escape? What crime do they commit? Are they stealing some bread for food to eat, or taking part in a heist? Maybe they're a hitman for hire and are stalking their next target. The possibilities are endless. On the flip side of this, they could be a detective solving a crime. Who did it? How will they catch them? Why was this crime committed? This one always makes me imagine something like X-Men where Logan is in a fighting ring. Could they be getting mugged and fighting for their belongings? Did someone push them over their line and they snap, lashing out at their verbal attacker? This is another one that has a lot of possibilities. In fact, Bryn Donovan has some amazing thing to embarrass your characters with. See her entire list here. What if they trip up causing a huge jam, or maybe they stop their car abruptly and it causes a traffic jam? Your characters could have been having an argument, discussing some confidential information with a friend or doctor. Maybe it's a YA and they're fighting with their siblings over the last piece of pizza. Nearly all stories start off in the protagonist's natural world. Maybe it's their birthday or they're having a Christmas party for work. What about if they are celebrating the new year, or at their village festival. Do your characters have some Wiccan abilities and try to celebrate one of the solstices? Are they attending a wedding or is your character graduating? Do you write fantasy? What kind of celebrations do they have in your world? Are there village parties that last a few days? Maybe they have festival's relating to the seasons? Starting your novel in media res is usually a good thing to do. That's in the middle of the action if you were unsure. It's a good thing to fall back on. Need to start a scene but aren't sure? What are your characters doing? Start halfway through the scene and play it out that way. For my novel Missing Prince, I have a prologue that starts straight in the middle of the action. The building is burning and they all need to escape. If that's not a hook then in the next chapter t starts with a horse race between my protagonist and his riding tutor. Is your middle-grade character annoyed with their parents because they're moving towns? Do you wake up in a strange place and have to figure out who you are like in Maze Runner? Is your character running away from their past by hiding in a new town? What ideas can you come up with that meet the criteria of New Surroundings? It could be anything! I know, I know, dreams are overdone and executed badly sometimes. But if done right they can be a great addition to a story. For example, my friend and very talented writer Sarina Langer incorporated dreams as premonitions into her book and had some the beginning of a few chapters. They worked well to enhance the story and therefore were executed well. Just don't use them as an info dump as that will turn readers off instantly. You'll need to have a reason for them, they have to bring something to the story rather than just filling a space. Another one I can hear other authors going "Nooooooo!" at. However, description is a necessity and if it sets the story right you can set your story up for a great start. What's your character doing on a dark night down an alley? Similar to Dreams and Weather. However, what if the flashbacks were of someone else's memories? That would make for an interesting story. There could be an earthquake, a bombing, tornado causing a plane crash. There are lots of possibilities. Try thinking about the worst thing that could happen to your character and then make it happen. Your character could find a relic, a book with notes handwritten by a stranger but directly to them. What about a journal of one of their grandparents detailing a list of their adventures in a parallel universe? Or maybe your character's family are hiding a secret about them and they find, adoption papers or missing person newspaper cuttings? Is your character learning to become an assassin? Are they joining a thieves guild (note the Skyrim references there)? Could they be training for an event, be that fighting, racing or building/baking something? This sets them up in their normal life and gives readers a chance to get to like them and learn why they should care about them. Internal thoughts are a great way to get the reader into the characters head. They learn feelings and connect with the characters on a deeper level. Your character could be in the middle of a courtroom, but what for? Are they defendant or prosecution? Victim or Lawyer? Have they found something that doesn't belong to them? Or witnessed something they shouldn't have? If you're super stuck a quick search on google will get you to some generators which may or may not be helpful. They could spark other ideas or simple lead you to finding the ideal starting point. Have you tried any before? Let me know the good ones. That's all my suggestions. Got some to add? Pop them in the comments below!